If you are looking for information on the Woodcraft franchise business opportunity, Woodcraft franchises or Woodcraft franchising, then you have come to the right place. 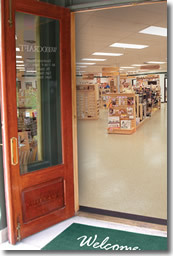 Carve a niche for yourself in woodworking with a Woodcraft retail store. It is difficult to overstate the importance of a brand name with a reputation for quality. The Woodcraft name is a tremendous asset. If you are a woodworker, you already know what we mean. Now, after more than 80 years, the Woodcraft name is even more recognizable than at any other time in our history. Are you seriously looking for a franchise opportunity? Are you passionate about woodworking? Would you like to consider opening a store in your area? Woodcraft Franchise Opportunity - Why Woodcraft? Training at the corporate office with additional on site set up and merchandising. Continual flow of new and innovative products selected by our Product Development team. Woodworkers represent a cross-section of the population, and they range from home hobbyists and handymen to professionals in the building trade, cabinet makers, and makers of fine furniture. Most woodworkers have been involved in woodworking for over 15 years. A typical woodworker averages more than six hours per week in the workshop, and spends between $400-500 per year on woodworking products, equipment, and supplies. Typical Woodcraft customers are male, with an average age of 47. Interestingly, the number of people who are of the age 45 and older are expected to be increasing, according to the US Bureau of the Census. While this increase in the number of potential customers does not guarantee the franchisee's growth, it is a statistic worth noting. "We're building a business that transcends generations. 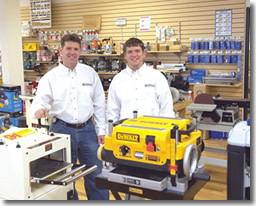 Having a Woodcraft franchise has helped us grow as a family while preparing our next generation for success." "We have to keep reminding ourselves that we are independent business owners. We are responsible for our own outcome, but we are part of an organization and part of a group or a family, so what we do has an influence toward Woodcraft. We have to maintain the Woodcraft image but we have latitudes to act independently. I have talked to several customers who are franchisees in other walks of life and I find that the Woodcraft organization is probably one of the best franchises out there because there is independence but there is also synergy between the two of us." Woodcraft Franchise, LLC ranked #353 in Entrepreneur Magazine's (the nation's leading business monthly) 29th Annual Franchise 500. Woodcraft has also been named the #1 Franchise in the Hobby Store category.